Harmony Science Academy Sugar Land will hold classroom spelling bees in each grade level Friday, November 2nd to determine eligible participants for the school-wide spelling bee. The first and second place winners of each homeroom class will participate in the school-wide spelling bee in December. A third place alternate will also be selected, but he/she will only participate if the first or second place winner is unable to participate due to extenuating circumstances. A printed list of your child’s grade level spelling list has been sent home and a soft copy has also been sent via email by his/her ELA teacher. 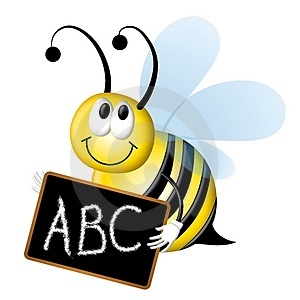 Please note that students who are absent on the day of the spelling bee will not be eligible to participate since the class spelling bee will only be conducted once. A full copy of the 2018 School Spelling Bee Study List will be provided to students who seek a challenge upon student or parent request. After all three meets have been completed, WordMasters organization will publish cumulative statistics and recognize about 100 of the most outstanding schools and about 200 individual students. We will provide study materials as well as support students during their GT pullouts. If interested, please fill out the attached permission form and return it to Ms. Chandler by November 1st, 2018. Moreover, if you would like more information about WordMasters and their competition, please click the website link below. 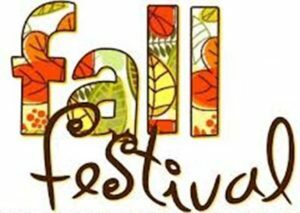 HSA Sugar Land students, faculty/staff and administrators are happy to announce that our annual Family Fall Festival will take place on Friday October 26th from 5:00 pm – 7:00 pm. Please come and join us for a night of fun!! The festival will feature activities including carnival-style games, prizes, face painting, the ever-popular Silly string corral, petting zoo, MD Anderson puppet show, bouncy houses, music, and more. The variety of activities will provide entertainment for all ages! Note, all Children must be accompanied by an adult. No child should be left unattended by parents/guardians during this event as there will be no supervision provided. Parking will be on a first come first serve basis. Additional parking space will be available across the street CenterPoint Energy Located on 13300 West Bellfort. Keep in mind that you must park in a designated parking space or your vehicle will be towed. Please do your best to carpool to ensure we have enough parking space. Thanks to Center Point energy for partnering with Harmony Science Academy Sugar Land for our Fall festival. We NEED your HELP to make this event a wonderful experience for our children. If you would like to be a volunteer for this event please reach out to Ms. Gil at Shirley.gil@harmonytx.org or Mrs. Stewart at kstewart@harmonytx.org. All volunteers must register at VOLY prior to volunteering for an even. Please turn in your donations to your child’s homeroom teacher starting Monday, October 8th. Any donations that you can make will be greatly appreciated! 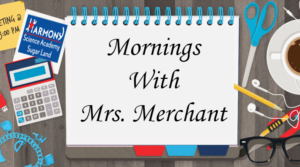 You are cordially invited to our annual “Mornings with Mrs. Merchant” on October 17th from 8:05 a.m. to 10:00 am. During this meeting you will receive valuable information about our school and the vision for your child’s academic success this academic year. Your child will be allowed to join you for breakfast at 8:05 am in the cafeteria. Students will be asked to return to class no later than 8:20 a.m. as presentations will begin promptly at 8:30 am. Please be reminded, students must arrive on campus no later than 7:45 a.m., parents can park after drop off and wait in the lobby until 8:05 a.m. If parents arrive after 8:05 a.m. your child will not be able to enjoy breakfast with you in the cafeteria as instruction time is sacred. Get Ready, Class Picture day is coming!! On Thursday, October 18, 2018, we will have Class Picture Day/Retakes. Students must be in their uniform for the Class Picture and for individual retakes, the individual retake picture will be used for the school ID. Class picture and retake order forms have been sent home. Please check your child’s folder for the flyers. 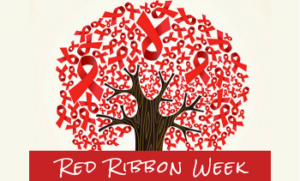 October 22-26 is National Red Ribbon Week. Please help Harmony Science Academy-SL in taking a pledge in helping our kids grow up safe, healthy and drug free. Join in the fun below. Monday October 22- Wear Red to help kick off Red Ribbon Week! Tuesday October 23- Crazy Hair to show you’re drug free! Wednesday October 24- “Be College Bound…Put Drugs Down! !” Wear your favorite college shirt. Thursday October 25- Wear your Superhero Shirt to Fight Drugs . Friday October 26- “Scare away Drugs” Wear your Vocabulary Day Costume. 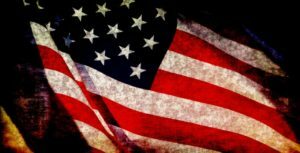 In observance of Veterans Day, Harmony Science Academy Sugar Land is cordially inviting all of our parents and grandparents who serve our country to a luncheon Monday November 12th at 10:00 am. Come and enjoy lunch with your child as we honor and remember your sacrifice and courage to defend our country. Please click on the link below RSVP. There will be a Houston Rubik’s Cube Challenge hosted by Harmony Public Schools on November 3rd at Harmony School of Enrichment (North). If your student is interested, please register your student via the attached link below. Since space is limited registration is on a FIRST COME FIRST SERVE basis. The registration DEADLINE is October 26th, 2018 for our campus students. 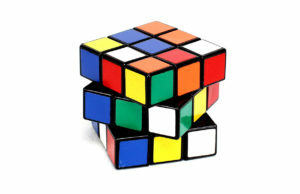 The challenge will consist of teams of 8 students collectively solving 3×3 Rubik’s cubes. It is FREE to register and compete however parents are responsible for student transportation and must be present for the competition.The competition will be held on a Saturday between 10:00 am and 12:00 pm. The Rubik’s cubes will be provided at the time of competition by our campus. Parents also need to fill out the consent form that will be sent to them once the registration is complete. 3207 North Sam Houston Pkwy W.
As Harmony Science Academy – Sugar Land campus, this is our second year becoming an official center and competing for XXII Math Kangaroo Competition for grade levels 1st through 5th. 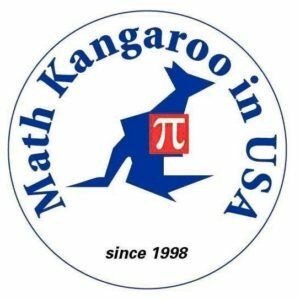 Math Kangaroo Competition is an international, once a year event, always on the third Thursday in March. This year’s competition date is March 21st, 2019. Last year 29,354 participants registered from 50 different countries. Our intention to become a center in this competition is not only to facilitate a productive academic extracurricular event for students but also to provide students skill-building opportunities in Math and other areas such as time management and most importantly to encourage an interest in Mathematics within all age groups. * Please keep in mind that this is an extracurricular activity and classroom teachers will not be able to dedicate time and/or provide educational support towards this competition. SINCE OUR CAMPUS IS A PRIVATE CENTER THIS YEAR, IN ORDER TO REGISTER YOUR STUDENT, PLEASE SEND AN E-MAIL TO MS. CHANDLER VIA schandler@harmonytx.org IN ORDER TO RECEIVE THE INVITATION CODE. Each student receives a t-shirt, a certificate of participation, and a gift in addition to a competition booklet and a pencil on the test day. Pictures are taken and placed on the Math Kangaroo web-site, our campus web-site and on social media. The competition questions are age appropriateand will challenge student thinking. In May, students who earned top scores at each level of participation are awarded with gold, silver andbronze medals and prizes. International Summer Camp in Europe, and college grants are among the prizes. 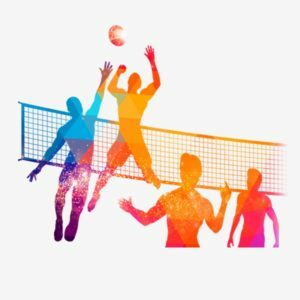 we will have another Parent/Staff Volleyball Game on Friday, November 2, 2018 at 5:00 p.m. in our school gymnasium. Please come and enjoy an afternoon of fun as we mingle and create stronger bonds with teachers and our school administration. Please click the link below to RSVP. May the scores be ever in your favor! 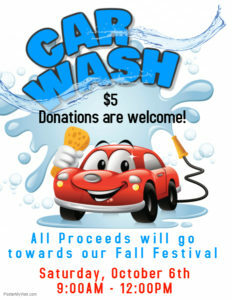 HSA-SL Car Wash is tomorrow Saturday, October 6th. Please come and support our school as all proceeds will go towards our Fall Festival. https://harmonypublicschools.network/hsasl-new/wp-content/uploads/sites/127/2017/10/HSA-Sugar-Land-WHITE-letters-300px.png 0 0 shirleygil https://harmonypublicschools.network/hsasl-new/wp-content/uploads/sites/127/2017/10/HSA-Sugar-Land-WHITE-letters-300px.png shirleygil2018-10-05 10:51:022018-10-05 10:51:02Car Wash! Our Fall Festival is around the corner. Here are some ways you can help support this event. Many of you have shown an interest in making a donation towards our Petting Zoo. So far we have received $125 and we have $475 to go. We are accepting monetary donations from $1.00 and up, any amount is welcome. You can make your donations at the from office. Please make checks payable to Harmony Science Academy Sugar Land. We appreciate your support in making this carnival a memorable one for our children. Forms of acceptable payment: Credit Cards, Checks and Money Orders ONLY. NO CASH will be accepted! We would like to remind you that there are various opportunities to help our school fundraising. Kroger Rewards Program is one of them. We are kindly asking all of our parents to link your Kroger’s Reward Card to our organization using the code QG947. You can stop by any Kroger’s service desk and have them link your rewards card to our organization. The more you shop at Kroger the more money our school will get! Together we can support our school! https://harmonypublicschools.network/hsasl-new/wp-content/uploads/sites/127/2017/10/HSA-Sugar-Land-WHITE-letters-300px.png 0 0 shirleygil https://harmonypublicschools.network/hsasl-new/wp-content/uploads/sites/127/2017/10/HSA-Sugar-Land-WHITE-letters-300px.png shirleygil2018-10-04 20:27:552018-10-04 20:27:55Help Support our School! We are now accepting new members for our Legendary Robotics Team. Members of the Legendary Robotics Team will compete with other teams around Houston. All interested parents are invited to a Parent Information Session this Saturday, October 6th at 12:00 pm in the cafeteria. The Jr. FLL team comprises of 1st – 3rd grade students while the FLL team comprises of 4th – 5th grade students. If you would like for your child to be a member of our Legendary Robotics team, please fill out the application form below. We have 36 spots available for the Jr FLL teams and 12 spots available for the FLL teams. Due date for applications is Monday, October 8, 2018. Filling out the application form does not guarantee your student membership in the team. There will be a selection process after October 8th and should your student qualify, you will be notified. Thereafter, you may pay your dues ($200 per student) at the front office until October 12th in order for your student to join the first session on Saturday, October 13th. The Jr FLL teams will work every Saturday between 01:00 PM – 02:30 PM in the school cafeteria starting October 13th until pending success at competitions. The FLL teams will work every Saturday between 12:00 PM – 05:00 PM in the school cafeteria starting October 13th until pending success at competitions. Note: This service is extended to Sugar Land Academy students and parents by a “Volunteer Parent” and is not a school club or school activity. 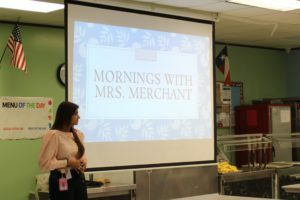 You are cordially invited to our annual “Mornings with Mrs. Merchant” followed by CIP and CNA information meeting on October 3rd from 8:05 a.m. to 10:00 am. During this meeting you will receive valuable information about our school and the vision for your child’s academic success this academic year. Your child will be allowed to join you for breakfast at 8:05 am in the cafeteria. Students will be asked to return to class no later than 8:20 a.m. as presentations will begin promptly at 8:30 am. Vocabulary Parade is Around the Corner! 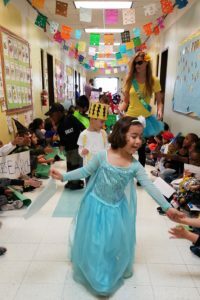 Please join us on October 26th at 8:30 am to our annual Vocabulary Parade. Students should dress up as a book character, a profession, or as their chosen vocabulary words. Students are not allowed to wear masks, paint their faces, or have toy weapons with their outfit. Students are expected to follow the dress code when dressing up for the parade. Parents are welcome to come and watch the parade from the parking lot as students will be walking around the building. October 2nd, is Lunch with Loved Ones. Students have an opportunity to invite their loved ones to join them for lunch during their lunch time. Don’t forget to stop by our Enchanted Book Forest and purchase a good book of your student’s choice. Please see the lunch schedule below.